Microcristallina Cera. 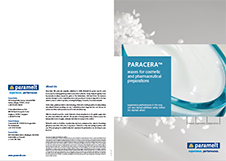 Paracera™ L by Paramelt acts as a consistency factor and binder. It is a hydrocarbon wax of microcrystalline structure. It is distinguished by its unique low congealing point. The low oil content and flexible character makes it very suitable for many cosmetic applications where good oil binding or viscosity regulation is required. Its applications include stick products, decorative cosmetics, creams and ointments and other cosmetic care products. Paracera™ L has a shelf life of at least two years.